University of Georgia Press, 9780820321516, 299pp. What is a Storyville? Whether you're in Toast, North Carolina, Monkey's Eyebrow, Kentucky, or Winner, South Dakota, a Storyville is a real town you can find on a map, with a tale behind its quirky name. Covering 20,000 miles of U.S. roads, Dale Peterson drove with his kids, Britt and Bayne, from Start, Louisiana, to Deadhorse, Alaska in search of small-town America in the "garage sale of the open highway." Along the way they explored open spaces, wild places, and country back roads and met people who weren't afraid to talk to one another. Together, they discovered the sights, sounds, tastes, and smells of nearly sixty small towns, as well as the zany stories behind them, guided by an AAA Road Atlas, expert local storytellers, and lots of curiosity. They dipped into Caddo Lake and the everglades of Uncertain, Texas, went a little crazy in Loco, Oklahoma, and learned about bee colonies in Climax, New York. Conversations with townsfolk range from the refrigerator at the center of Noodle, Texas, and the hazards of Accident, Maryland, to issues of civil rights, religion, and environmental preservation. Collected here are the landscapes, landmarks, faces, thoughts, and conversations of a sentimental, idiosyncratic, and often hilarious American odyssey. 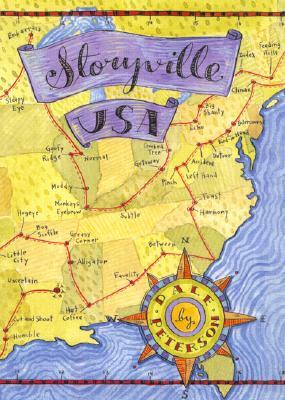 "Storyville, USA" is a long, winding trip into the back roads of the country and a longer one into the hinterland of our own hearts.